How is this a free call, is it a limited time offer? I'm just curious……how is this business profitable for you if there is no cost incurred by anyone who uses this service? If I can get conference calling for free, why would I buy an 800 service? How many callers can be on a conference call at one time? Is there a time limit for the length of our conference calls? Can participants in the conference access the conference outside of the country? Can callers enter the conference at any time? Do you have the ability to let me set up recurring weekly or monthly scheduled conferences? How long does it take to set up a conference? Do we have to have email to participate in a conference call? How safe are our email address in our contacts? Will they be sold or made available to others? Do you offer recording on conference calls? Can we record personal greetings? Why does it says that my pin number is invalid when I attempt to enter my pin number? Your site is not clear on what a "moderator" pays to use the service. I understand it would be free for our participants, but what about us? Are there any costs incurred by the moderator, or person who hosts the call? I see the calls can be recorded. What file types are provided for the recording? How do we access the recorded files? With your service you can remove nuisance lines or mute lines from the web. Is this something the call operator handles, or the moderator? If the moderator picks out the nuisance lines, what indications are given so you can easily tell which lines are causing the distractions? Obviously a free service is always better than having to pay for a service, but what I'm not clear on is if there are any costs I should expect to see once we get started? In addition to just the basics of what you offer, are there any costs for any additional services? How do I go about setting up an account? How much does a conference call cost? I don't see a place that lists pricing. What if our families, friends and/or our business associates are spread out in several communities and we would like to talk with them all at one time? How would Midwest Conference Line help us to overcome that obstacle! What a great idea to have a conference system like this but I wouldn't know how to use it. Hi. My friend with a Net-Working Company told me today about the conference line she was able to get through your company. I would be interested in acquiring one for our team and downline. Could you provide me some info? This Conferencing System looks pretty interesting. Perhaps it would be something we could use for our dealer network conference calls. How can Midwest Conference Line set this up and offer it for free? One thing I want to make sure of, is this - Are you saying that my conference calls can last one hour or two hours or three hours. Actually, my calls last 10 minutes with Q & A after that, but I just wanted to know. You're saying this is free to use, other than the cost of the long distance call each person on the call has? Can I use the system to do conference calls for my networking business? 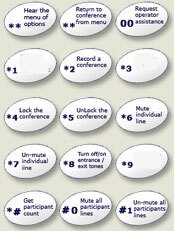 Does it work like other conference lines I have used, just dial in and use a pin number to get to the conference call? Can I use the line any time I want during the day for 3 daily conf calls? How long can the conf call last? Tell me what it would take to set up a conference line for our family. We are scattered over 9 states I believe. Our internet phone works good most of the time and only costs $30 per month unlimited states calling even though we are in Nicaragua. I am having a problem login on. I use Xxxxx Xxxxx for the user name and xxxx for the password but it does not let me on. The conference calls are subsidized by telephone companies, so we offer conference calling at no cost to you and it will always be at no cost. The only cost will be normal long distant rates. Participants can use long distance or prepaid calling cards. We do offer 800 numbers at a low cost. I'm just curious.....how is this business profitable for you if there is no cost incurred by anyone who uses this service? So your guests do not have a long distance calling charge on their phone bill. By having an 800 number for guests to use, you the host will take the burden of long distance fees from your participants. Are there a maximum number of callers per conference? 250 callers can be on a conference call at one time with the option to increase the limit when it is necessary. We monitor the conference calls daily. If we reach 80% capacity we start reassigning conferences. This does not affect your call flow and you would not notice any changes. Rest assured we are always working on increasing our capacity. No, there is no time limit and there is no limit to the times you can use it per month. Yes, anyone with a telephone can reach our conferences but of course will incur the long distant rate. Yes, participants can enter and leave at any time with the dial-in number and access code. Yes, the dial-in number and access code will be the same. You will be able to add and delete participants in the conference in the contacts page. If you want a Conference Id number etc. designed specifically for you, then we can have it set up for you within 48 hours after we have that information. You have to contact us for that. No, the host of the conference can provide the members away from their computers or without email with the date and time of the conference and then the phone number and access code. We at Midwest Conference Line value your privacy and our relationship with our clients. We will never sell or share your email address with anyone. Yes, we provide free recording, access, and downloads* of your recordings for up to 30 days. When you choose to record your call you will receive a six digit pin number that will allow you to access your recording by phone any time during the 30 days. *free downloads are available with the Midwest Conference Call with Web Control. Your recordings are stored in mp3 format so that you can email them to other associates that could not attend your conference. If you wish to have a personal greeting recorded contact us. It requires certain amount of minutes used per month in order to make it financially feasible. It is something we do encourage for larger corporations. There are no costs incurred by the moderator(s), the host(s) and the participants because the conference calls are subsidized by telephone companies. Currently the file types are Wav files and in the future we will be offering MP3 files. We (The Call Operator) would be blocking the nuisance phone numbers for you and you as the moderator would be muting the line(s) on the Web. You WILL NOT incur any costs once you get started except for your regular phone call. We have voicemail boxes and information lines for $25/year and if you get three of them, then the last one is free. How much does a conference call cost? I don't see a place that lists pricing? It doesn't need a place to list pricing because it is FREE. Here is what the procedure is: First you would send us your choice of what you want for a Conference Id (access code), Moderator pin number, Username and Password for your account and after everything is set up you would then use it as your Conference Call Center (bridge) for your business calls with all your associates and/or your prospecting call when you prospect for more associates etc. This would be at no cost to you or to any of your people except for your regular phone call and/or your people's regular phone call because the conference line is subsidized by telephone companies. What a great idea to have a conference system like this but I wouldn't know how to use it? First, you choose the Conference Id, then your Moderator pin number. Then you would tell all your people to call a phone number (that we have set up) and use your Conference Id. That way you could talk with each other all at once. In order so no one else gets control of that Conference Id number, you shouldn't give out your Moderator pin number. You bet, I think so too! How can Midwest Conference Line set this up and offer it for free ? Because the conference line is subsidized by telephone companies, it is totally free for you to use except for your regular phone call. Yes. The Moderator has a different pin number than what the other participants would use to access the Conference call (if he desires it that way). The Moderator can choose both pin numbers, if those numbers are not chosen already. 24/7. You can shut down the conference call anytime. All I need from you is the Conference Id number that you want, the Moderator pin number that you want, and your contact information. The numbers should be 6-7 digits long. Yes, that's a good way to keep in touch with your relatives and friends and have a reunion on the phone. Try using lower case letters.